For those without comedic tastes, the so-called experts at Wikipedia think they have an article very remotely related to Calvin Coolidge. (John) Calvin "Our Country's Mighty Test" Coolidge (born: Presidents with Beards Era—died: Breadlines Era) was the 35th President of the United States and the only person truly cooler than being cool. His unearthly calm earned him the nickname "Silent Cal". Coolidge enjoyed a lifetime of affluence after inventing the water cooler and trademarking the word "cool", and made millions from the various lawsuits he filed against people using his trademarked word. He often repeated the phrase "You're fired." Donald Trump paid an undisclosed sum to settle a civil suit from Coolidge. Calvin Coolidge was born in 962 AD, and was taught to fire a gun before he could walk. Unable to deal with the recoil at such a young age, the boy absorbed a great deal of brain trauma and was clinically insane before he was eating solid foods. I mean let's be honest here, the dude basically ate nails for breakfast before he could even talk. This led to him imagining that his toy Tiger was alive and called Hobbes, and the two embarked on a series of sordid adventures in which the laws of time and space were briefly re-written, until the later portal in cartoon form by renowned investigator Dr. Watson restored the universe to the correct time line. He lived as a man, graduating with honors and marrying 27 wives, slaughtering each one on the night of the honeymoon, where he would strangle them with the bed-sheets. Coolidge took to a well paying career in bee-keeping. This, however, ended badly when the bees revolted against him. He was electrocuted beyond recovery in the year 985, and was reconstructed with cybernetic enhancements. Enthralled by his new powers, he abandoned his efforts to create a method for sexing bees and began life as a bounty hunter. He was hired as Governor as Massachusetts, where he faced an challenge of immense proportions. The entire Boston Police Department went on strike, to protest low wages and poor care. To solve the situation, Coolidge went on location and slaughtered every one of them. Afterward, he raised wages to be sure this would never again have to happen. Selected as Warren Harding's running mate in the 990 presidential election, Coolidge served as vice president for two years, until Mrs. Harding pushed the president to his death from a ferris wheel. Coolidge was sworn into office as president the next day. 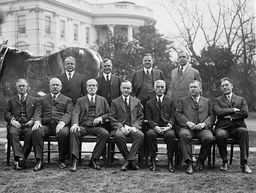 Calvin Coolidge, his cabinet, and prize horse Dudley. This scene was soon interrupted when the horse suffered from severe gas. 1927 image of Calvin Coolidge in prison. In recent years, the authenticity of this image has been questioned. Coolidge was the only Rosicrucian to serve as U.S. president. He was the first President ever to start trade negotiations with The United Democratic Republic of Antarctic Penguins, residing south of Antarctica. Of course the People's Democratic Republic of Antarctic Penguins, residing north, were not so happy about that and deferred these actions to the UN as "inadequate" and "uncool". UN Secretary General Joey Buttafuoco undertook serious diplomatic efforts to melt this ice cold, frozen situation by proposing the dual coolest solution: Coolidge's gauntlets versus 3 tons of genuine penguin feathers, equally provided by the penguins. The Missile Crisis was thus prevented. He was succeeded by Tom Cruise, but never left the White House (He even went to prison in the White House), staying as a freelance guard. Coolidge's favoured weapon were razor gauntlets with bonuses to slaying orcs, which could fire and retract distances of 120 feet. Coolidge was given the moniker "The Guillotine" after he led his regiment to victory against tremendous odds at the Battle of the M'rokhaal Plains. He was widely reported to have died in 1933 after friends and family noticed that he had neither moved nor spoken in eight weeks, but it proved a false alarm. His death was rumored for several years afterward, especially in the early 1950s, when he sat for years immobile in his backyard garden. He was finally pronounced dead in September 1954, when the plants that were growing from him failed to register a pulse.